Review: 2014-04-19, the pace slows down in the second part of the fight but the first part was really nice: Fabricio Werdum vs Travis Browne gets three stars. The black belt in Brazilian jiu-jitsu and judo Fabricio Werdum entered this fight with a professional mma record of 17-5-1 (82% finishing rate) and he is ranked as the No.4 heavyweight in the world, he suffered his last defeat in 2011 when he faced Alistair Overeem (quarterfinal of the Strikeforce Hw Grand Prix Overeem vs Werdum), since then he has fought and won three times but just once in 2013 against Antonio Rodrigo Nogueira (=Nogueira vs Werdum 2). His opponent, Travis Browne, has an official record of 16-1-1 (87% finishing rate) and he entered as the No.5 in the same weight class, the only fighter who defeated Browne was Antonio ‘Bigfoot’ Silva in 2012 (Browne vs Silva), after that bout he has collected three consecutive wins via ko in the first round: against Gabriel Gonzaga (=Browne vs Gonzaga), Alistair Overeem (=Overeem vs Browne) and Josh Barnett (=Barnett vs Browne); currently the #1 in this division is Cain Velasquez. 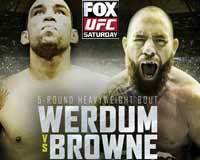 Werdum vs Browne, Ufc heavyweight title eliminator, is the main event of UFC on Fox 11. Watch the video and rate this fight!